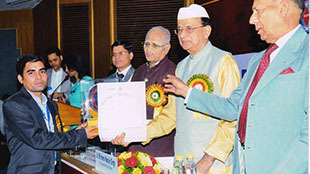 Rapid Organic is awarded with "Jaivik India Award for Best Farmer Linkage" by Shri N.H. Shivashankara Reddy, Agriculture Minister of Karnataka, Mr. Manoj Menon, Executive Director, ICCOA and by Shri Sompal Shastri, Former Minister of state-Agriculture Govt of India. 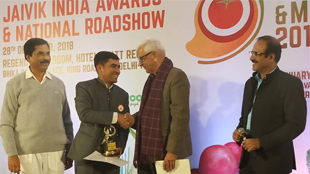 The award ceremony is jointly organised by GOVT OF KARNATAKA and ICCOA on 28th of December 2018 at hotel Hayat Regency Delhi and at this moment this award is given to Mr. Yogesh Joshi, Director of Rapid Organic for best farmer linkage. 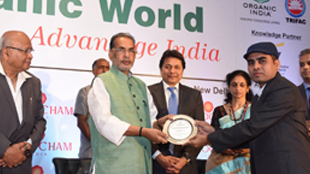 Rapid Organic is again awarded as "Best Company with Direct Farmer Linkage" by Honorable Radha Mohan Singh Ji, Central Minister of Agriculture & Farmers Welfare, India. 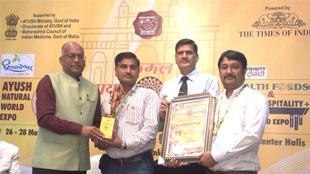 The National Conference & Awards on Organic World was organised by MINISTRY OF AGRICULTURE & FARMER WELFARE along with ASSOCHAM and APEDA on 21st of March 2018. We glad to got selected for "Organic India Excellence Award for Direct Farmer Linkage". We really appreciate our government for promoting organic food and encouraging farmers to grow more organic for better future of India. 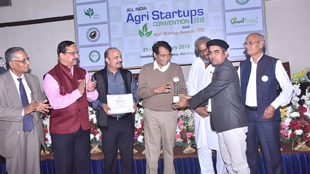 Rapid organic honoured with "Agri start up award 2018" for innovative model and excellence organic sector by Commerce Minister Govt of india Mr. Suresh prabhu , State minister of maharashtra (state agriculture ayog) Mr. Pasha patel, ICFA chairman Dr. M.J. khan, Mr. Vijay sardana from UPL group and professor M. Moni (Former DG ICT group). 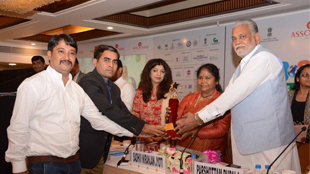 Rapid Organic Pvt ltd awarded as Best organic Food Producer Company, honored by Shri Parshottam Rupala, Hon'ble Minister of State for Agriculture & Farmers welfare, Govt of India and by Ms. Sadhvi Niranjan Jyoti Hon'ble Minister of State for food processing industries, Govt of India, Ms Bhagyesh Soneji, Chairperson ASSOCHAM in @ 11th International FAD in Concurrence with INNOVATION & EXCELLENCE AWARDS on 7th September - 2017 at Hotel Pride, Ahmedabad, Gujarat. Consecutively third time RAPID ORGANIC honored with QUALITY MARK AWARD for maintaining its excellent quality of Organic Products. 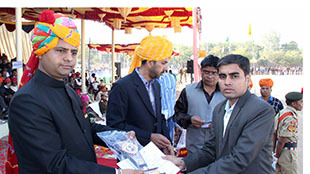 Mr Yogesh Joshi,Director of RAPID ORGANIC collecting Award by honorable "Shri Vallabh Bhai Kakadiya, Minister of Transport Gujarat Govt" well known Bollywood actor "Mr.Arbaz Khan" and "Mr.Sharvan Rathod, Bollywood Music Composer" other well know dignities present at program were "hon'ble Sadhvi Niranjan Joyti, Central Union Minister of State Food Processing" Mr.Gautam Shah, Major Nitin Joshi and Mr.Bipin R. Patel. Rapid Organic honored with "AYUSH KAMAL BHUSHAN SWADESI NATIONAL AWARD" for it's outstanding efforts to promote ORGANIC FARMING. 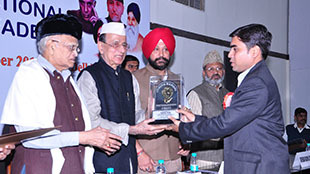 Mr. Prithvipal Singh "GENERAL MANGER" and Mr.Gajendra Singh "PROJECT MANAGER" Receiving a honor from "Mr. Dave Prasad, Ambassador of Trinidad & Tobago", "Dr. Kuldeep Kohli, Director, Ayush, Govt of Maha" & "Padmashri Dr. Suresh Chaturvedji, World Ayush Expert"
Rapid Organic Pvt Ltd honored by Ms. Sadhvi Niranjan Jyoti, Hon'ble Central Minister of State for food processing industries Govt of India, Shri Parshottam Rupala, Hon'ble Central Minister of State for Agriculture & farmers welfare Govt of India, Dr. Soe Than, Hon'ble Minister for Agriculture & livestock Govt of Myanmar and by Ms. Bhagyesh Soneji, Chairperson ASSOCHAM, for its outstanding performance in Organic food sector. 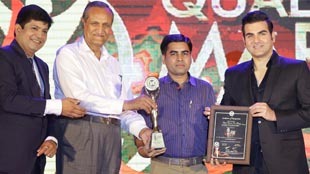 For its continuous outstanding performance in the ORGANIC Sector "RAPID ORGANIC PVT LTD." honored by Ms. Sadhvi Niranjan Jyoti, Cabinet Minister of food processing industries Govt of India, Bollywood Film producer Mr. Madhur Bhandarkar and by Mr.Amit Doshi, CEO of Divya Bhaskar Newspaper. "I congrats team rapid for their sincere and hard work and also I would like to dedicate this award to My farmers without whom it was not possible for me and my team to get this success. - Yogesh Joshi, Director of Rapid Organic Pvt. 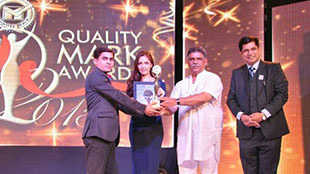 Ltd."
"RAPID ORGANIC PVT LTD" honored by Shree Gajendra Singh Khimsar, Hon'ble Industrial Minister - Rajasthan and by Bollywood Star Ms. Shazahn Padamsee, as best quality organic food Trader. This award shows our potential and dedicated team work done by Rapid Organic in organic sector. We are thankful to our director MR. YOGESH JOSHI as under his vision and dedicated work we have reached this marvelous platform. 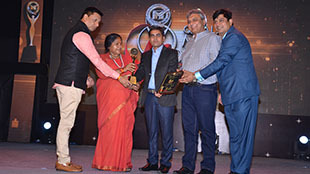 Rapid Organic have been working with more than 8000 farmers since 2000, So with its vision to connect with farmers and encourage them to get involve in organic food farming, Rapid Organic is awarded by Indira Gandhi Priyadarshani Award 2014. Our Director Mr. Yogesh Joshi is honored by District Collector Mr. Rajan Vishal for his excellence work in Organic Farming. Mr. Rajan has appreciated his work in organic sector and encourage him to continue his work in order to connect more farmers in his mission. Indian Economic Development & Research Association (IEDRA) awarded Mr. Yogesh Joshi, Director of Rapid Organic Pvt. 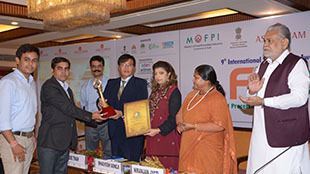 Ltd. by Indian Industrial Excellence Award on dated 12th November 2013 for his excellence in Organic Sector. 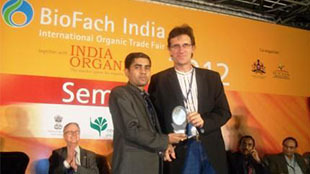 Rapid Organic has participated in BIOFACH 2012 as Bronze Partner. Our Director Mr. Yogesh Joshi awarded by Konrad Hauptfleisch, Academy and Programs Manager at IFOAM - Organics International. "We are very thankfull to ICCOA Team for developing such a great plateform and giving us chance to participate in BIOFACH as Bronze Partner. - Mr. Yogesh Joshi, Director of Rapid Organic Pvt. Ltd."